It is the era of instant messaging one may say. There are so many different messaging platforms today and being available on one has almost become a must. 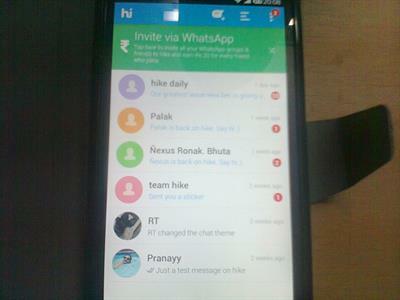 It has been advocated by WhatsApp, Nimbuzz and now, Hike messenger app. It is the only Indian messaging app and has been developed by Bharti Softbank, a 50-50 partnership with Bharti telecom and Japan's Softbank. The app has got a lot of attention in the recent past and rightly so too. Similar platforms have been seen as a better platform than SMS and that is the simple difference that Hike presents. It is a messenger platform that is viable on different platforms. The application can be used even if you do not have access to mobile internet or data on the go; you can communicate with users with SMS. That seems to be the standout feature in the application and duly makes it the third most common free app in the Google Play Store. The highlight of the many Hike messenger app features is the different ways to communicate. There are 3 different ways for this –the first is hike-to-hike messaging with other users, this is free and unlimited across the world. Here is where the magic begins. You can communicate with other smartphone users, even if they do not have the Hike app installed via SMS. At the moment, this is not a feature that is available across the world – rather only within India. The first and final use is via a SMS. There's a plus for the recipient too, in case they are flooded with messages from your end, they can very easily block you with a code. There are tonnes of Hike messenger app features that are bound to stand out. For example, a Hike user gets 100 free SMSs each month to send to people that are not on the application yet. This however does replenish each month. Also in the event that a friend joins the application upon your message, you get 10 SMSs free and the company will give you 50 free SMSs/month to the friend that they have invited to the application. The company has kept the social angle efficient too with you being able to invite your friends through Facebook and Twitter. Plus, the moment you connect to either social media channels, you are given 100 SMSs as bonus. It is not a 1 time thing, the company plans to do it as repeated bonuses in the future too. There are also several advantages when compared to the user interface on Whatsapp. On Hike, the interface is extremely clean and a very pleasant interface of white and blue. To get started, you have to enter your mobile number and then you get a 6 digit code via SMS that has to be entered for confirmation. When you enter the application, you get Rs 10 and each time you successfully invite a friend to the app, you get Rs 20 credited to you. Quite interesting to say the least! You have an upload limit of 6 MB via messages and you get fairly quick response on stable internet. The usage is very simple and you have very similar functionalities when compared to Facebook. The 'nudge' option is exactly like 'poke'. A disadvantage with WhatsApp messenger is the lack of a private chat. Hike gives you an option to hide your private chats with a simple code. You can maintain chat privacy very easily and this has to be the biggest advantage of this application. Many have drawn parallels with the telegram application, but in reality Hike is way better than Telegram app for privacy control. All in all, the app looks like a fantastic addition on your phone, the one downside is the lack of users on the app right now – but it looks to be adding on with each passing day. Our Indian messaging app allows users to choose who will be able to see their status updates as well as "last seen" update. This feature is not available in Whatsapp. In addition to smileys, Hike even provides plenty of stickers for better and attractive chat experience. In fact, the TV advertisement on this messaging app focuses more on the sticker provision. With the stickers of Indian movie stars saying popular one-liners, this app surely proves to be one of it's kind. With Hike being an Indian messaging app, it has lots of features that have been included to cater to the needs of an Indian audience. One can expect plenty of additions along similar lines in future. This messaging app gives rewards to users for inviting more friends. Every new friend that joins your Hike network will make you richer by Rs.20 of free talk-time. This app has become very popular in India. Me and my friends use it regularly for communication. Just a few days ago, Hike raised $65 million in funding lead by Tiger Global. It will be interesting to see which are the new features which they ad in coming days. Thanks a lot for writing & sharing the article. Keep contributing!